I am pleased to announce that the winner of Caption Contest 37 (the Thanksgiving Edition) is ... HalLoweEn JacK! Don't get me wrong, I like cats just fine, but this caption made me laugh every time I read it. It's the look of absolute glee on the girl's face that does it. I don't condone kitty cruelty though, let's be clear on that! Kaiju: Wow! I never knew hansel smeled so good! Scorpidius: Wow, lets give mom a big hand!!. . . . . oh wait! John D: Oooo yummy! Daddy DID come home for the holidays!!! 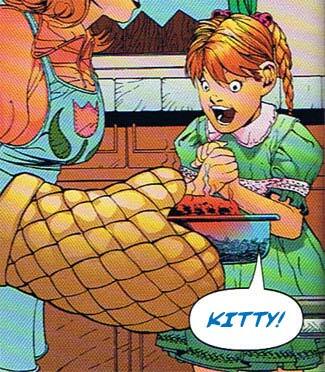 Jester: I’m so glad you used the Betty Crocker recipe… But what are we gonna tell her folks? Many thanks to all the entrants! As always, I'll be posting the prize to the blog for everyone to enjoy (assuming JacK's all right with that). Check back in a bit for Caption Contest 38 and your chance to win your very own custom black and white illustration of whatever you like! Thanks Jeff! I hope my request for the prize doesn’t spur you to violence! This genuinely got a laugh out of me. Props there JacK. Man I haven’t even had an honorable mention in a while. I need to step up my game.